According to Hubspot, users don’t have any problem in communicating with the AI chatbot for their instant response. Chatbots are making their own space in the marketing niche. Using chatbots to boost the marketing efforts has emerged as one of the newest trends in the market. But, how are bot development services bringing this transformation? What role do these automated bots play? 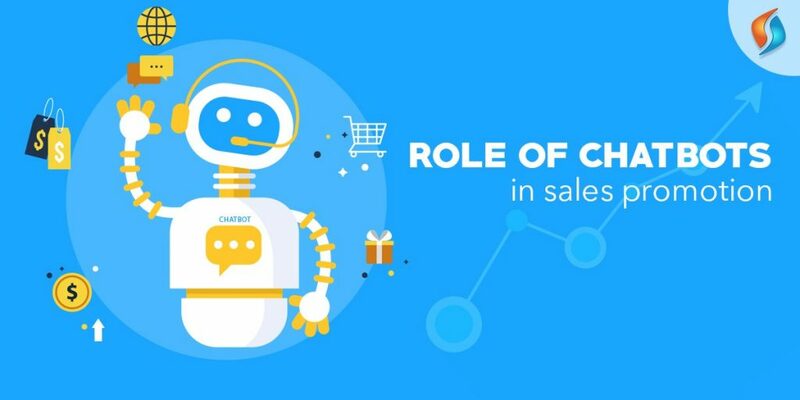 How do chatbots help in sales promotion? Well, by the time you will end up reading this post, you will have all the answers. What seemed in its early days to be a machine-like experience has now been transformed into a more personal experience. AI chatbot can now quickly identify the user behavior, their habits and lot more to make the initial interaction with them lot more personal than you would have ever imagined. And, this has been one of the primary reasons why chatbots have garnered such an immense rise in popularity in the marketing niche. Marketing and promotion have always been about active engagement with the audience. Engaging in something that keeps the user hooked up from the moment he or she visits the website. It is through this initial interaction that you can strike a conversation, build a bond and push the customer further down in the sales funnel. This is precisely what sales bot can help you achieve. By sending relevant information to the audience while they are on your platform, chatbots present your business with an opportunity to entice the customer in one way or the other and stay on your platform for long. And, the longer the customer stays on the website higher are the chances of making a sale. The biggest superpower of AI chatbot is their capability to gather a large volume of data. These bots collect meaningful data from the interaction and use it to help your marketing team plan better campaigns. Marketing today is all about gathering meaningful data. You can create your chatbot to use that data to create campaigns which can prove to be successful. With the help of bot development services, this entire process can be simplified and hence they can prove to be a great addition to your marketing team. One of the most significant advantages of using chatbots for sales promotions lies in the fact that they are proactive. Contrary to human response, which can be delayed as you cannot always have someone available to respond instantly to customer queries, these AI chatbot can virtually do that for you. This not only makes sure that the customer does not leave your business website empty-handed, but also leaves a lasting impression as well. After all, responsiveness is one of the most important factors that people consider when interacting with a business. These bot development services can eventually make your business proactive instead of just active. And, it’s not just hearsay. The most prominent brands in the market are using the power of the bot development services for building their brands. Two of the most prominent examples of AI chatbot being used by brands come in the form of ‘My Starbucks Barista’ from Starbucks, and Epic Reads and Book Genie from Harper Collins. And, many other names are slowly but surely following their path by developing their own AI chatbot. Right from information gathering and recording data to customer interaction and whatnot – chatbot development services can virtually do everything you can expect to get from a promotional tool making them a smart investment for your business. So, are you ready to invest in it? Hire the best Chatbot Development Company! If you are looking to leverage the power of technology and give your marketing efforts a boost with the help of bot development services. Then, Signity Solutions has proven expertise in the field that can be of great help for you. Hire our outsourcing team now and let us take care of your development needs.